I was watching the Indycar race from Las Vegas this evening and a terrible crash has robbed us of one of the great drivers of recent years. Dan Wheldon a two time Indy 500 winner and 2005 series champion died due to traumatic injuries sustained when his car got airborne and hit the catch fencing which is mainly designed to protect the fans. 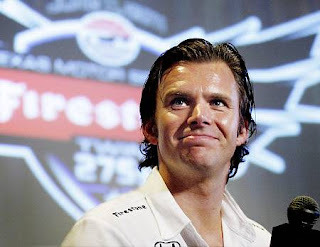 Dan has been a great champion for the series and the sport having been embraced in the US despite not getting the recognition he deserved in his homeland such is the dominance of F1 but he left his mark and unfortunately also a wife and two children.